Retro “future” is hot amongst graphic designers. There’s a big trend these days with graphic designers “retro-fying” modern media. 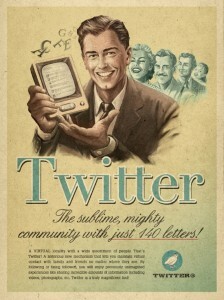 Among the most popular projects was a series of retro ads for Facebook, YouTube, Twitter and Skype. San Paulo firm Moma Propaganda created the fake ads as part of a “Everything Ages Fast” campaign for Maximidia Seminars. You can see the social future ads at Laughing Squid. 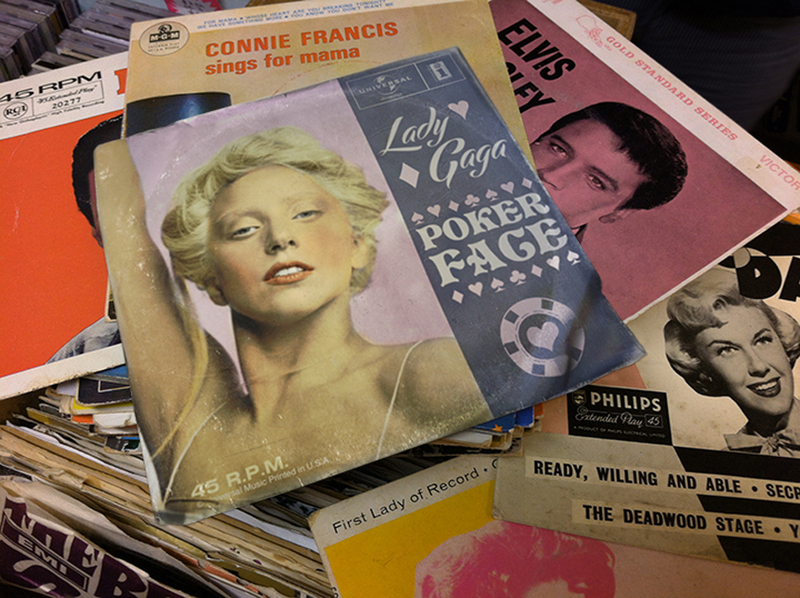 What I can only assume was more of a challenge is Robert Penney’s “back in time” 45″ record covers for a few of today’s top performers, including Lady Gaga. Penney had to transform the singer’s look, as well as “weather” the sleeve. The result? Imagery that could easily be mistaken for a real thing. After all, people played poker in the ’50s, right? To further illustrate the finished work, Penney integrated the “Poker Face” single in a photographic collage of other artists of that year. Lady Gaga’s hit single seems to fit right in with the likes of Elvis and Connie Francis. Penney also aged covers to The Libertines, Interpol and Thom Yorke. He also focused on the year to determine typography, hair styles and lighting. Lady Gaga’s cover is from 1957, while Thom Yorke’s steps into 1986. You can view Penney’s collection of works at Penney Design. Take a look, and be sure to let me know what you think! I’d love to see a ’60s country single for Luke Bryan!